(Bloomberg Opinion) -- The jobs report on Friday brought a little good news for investors worried that a key part of the decade-long bull market is about to run out. 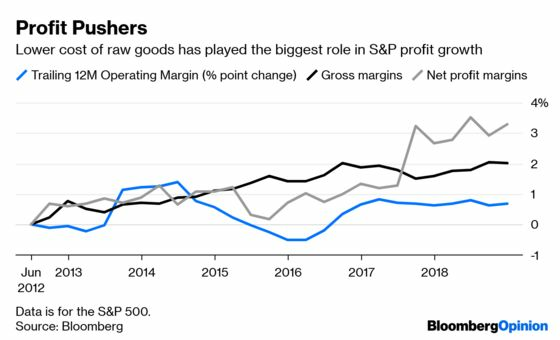 Profit margins, which have reached record levels, are predicted to drop in the first quarter for companies in the S&P 500. While the drop is not expected to be sharp, there has been a growing concern that it could deprive the stock market of a vital ingredient. If profit margins were the same as they were in 2012, for instance, the S&P’s earnings would have been $120 a share in 2018 instead of $158. One of the main worries is that wage growth could cut into corporate bottom lines. Higher wages, of course, can benefit the economy, but they can also push up costs. On Friday morning, the government reported that on average workers wages rose 3.2 percent in March from a year ago. 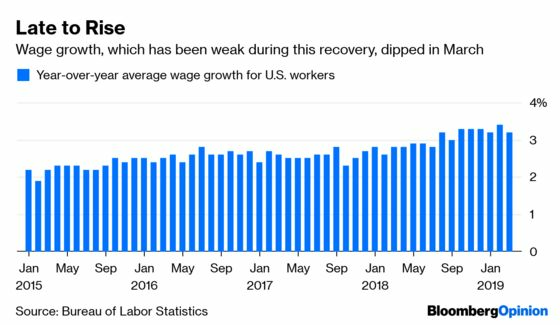 While that’s still healthy wage growth, and the seventh month in a row that the figure has topped 3 percent, it was lower than economists had been expecting and was down from 3.4 percent year-over-year growth the month before. It is hard to know just how much tame wage growth played into the increase in profits. Globalization and relatively low commodities prices have contributed as well, holding down input costs. Over the long haul, it appears taxes played a bigger role in margin growth than wages. In the 1940s, taxes as a percentage of gross domestic corporate income were 7 percent. That number has dropped to 1.8 percent. Workers’ wages on the same measure are down, too, but only to 53 percent from 55 percent in the 1940s. Input costs have done their part as well. The recent widening of profit margins started in 2013, with a brief dip in 2015. Since then, net profit margins for the S&P 500 have risen to 12 percent from 9 percent at the end of 2012. Companies don’t break out specifically what they pay to workers because it gets wrapped into their operating expenses. Operating margins are up since 2012, but less than a percentage point, to 13.2 percent from 12.5 percent six years ago. Gross margins, on the other hand, which are affected by lower raw material costs, have risen to nearly 34 percent from 32 percent in 2012. What’s more, stock investors seem to have anticipated the drop in profit margins. The price-to-earnings ratio of the S&P 500 is now 16.7, based on the next 12 months of earnings, down from nearly 19 in late 2017, which was one of the highest it has been excluding the dot-com bubble. High profit margins were certainly a big reason, but not the only one. Also feeding into the high multiple was high profit growth and low interest rates. Profit growth is still a significant concern, with first-quarter earnings expected to drop nearly 4 percent. But it now looks as if interest rates will remain low for longer than thought. And the boost from taxes is likely to stick around for at least another two years. Profit margins are certainly something investors, and economists, should keep an eye on. What they say about a watched pot is holding true here as well; this one does not appear to be boiling over yet.